Well, it is good to be back at home and to know that many others are also back at home and that things are beginning to return to normal. 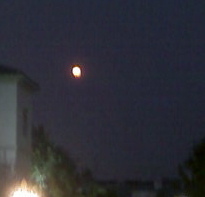 Tonight's full moon was a little bit orange from the smoke that still lingers. The photo here, taken with a mobile phone camera, doesn't quite catch the color. The smoke is gradually clearing with a very mild ocean breeze. I felt reassured this evening, while driving through a neighborhood that was still under mandatory evacuation this morning. Everything seemed so normal, almost as if it hadn't happened except for a number of dry trees in one place where it seemed the fire must have come very close, the heat leaving trees very dry without actually catching them on fire. There was a little more traffic than usual, and I thought some other people wanted to drive around and see that things were all right, or to drive further and see where the damage was. The only really burned area that I have seen yet is the Marine Corps base along the freeway, miles from here, where there was a fire yesterday. By this afternoon, only about 2,500 people were still evacuated at Qualcomm Stadium. The remaining evacuees will be moved tomorrow to the Del Mar Fairgrounds, and the Chargers may play at Qualcomm on Sunday. That seems increasingly likely as a way of reassuring people that San Diego has pulled through the worst of the past week's problems. There is still fire in many places in southern California. There may be more dry weather as soon as next week, although winds as strong as last week's winds seem unlikely to happen again soon.